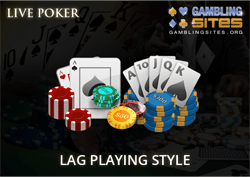 LAG, otherwise known as loose aggressive poker is just as it sounds. A LAG player will be all over the map in terms of their approach to the game. Loose aggressive players can be both winners and losers. Just because someone is loose, it doesn't automatically mean that they are losing players, though this is going to be the case more often than not. There are plenty of loose players who know how to pick their spots and time their aggression so that they are winning a lot of pots with their unconventional style of play. If you don't think that you already fall into this category of players, it's probably not a good idea to try and adopt the strategy now. Though loose aggressive players can be big winners or big losers, the one thing that holds true is that they will both experience large amounts of variance. The very nature of loose play doesn't lend itself to smooth rides in poker. You are going to have sessions where you win a bunch of buy ins, but you are also going to have sessions where you lose a bunch as well. This extreme variance is one of the primary reasons why most players don't even bother to attempt playing loose and aggressive. You are essentially going to be teetering on the edge of disaster with many of the moves that you make when playing LAG, so you most definitely need to be prepared for the ride. When it comes to pre-flop strategy, loose aggressive players are going to be making a lot of open raises, frequent 3/4-bets, and just about everything in between. This style of play isn't exclusive to post-flop situations by any means. A LAG player is going to take advantage of the absolute most steal opportunities that they have. A good loose aggressive player is going to be more worried about taking down pots pre-flop whereas the losing LAG player will not mind seeing a bunch of flops. The general rule of thumb in this case is that the losing players are action junkies while the winning players just want to win as many pots without a showdown as possible. From an opponent's point of view, this is going to be one of the easiest ways to decipher between a good and a bad LAG player. It's not so much that a LAG player will often times get way out of line, it is instead that they will pounce on more of the traditional opportunities that they have. For example, even a regular TAG player will toss in a light 3-bet from time to time if they think they can pull off a steal. However, the LAG player will be making these 3-bets at a much higher frequency. The simplest way to look at it is by knowing that the LAG player is going to ramp almost all of the action up. They don't reinvent the wheel, they just inject it with a new level of aggression that many players aren't used to. Post-flop strategy for a loose aggressive player is going to involve a lot of calculated risks. Where some players would rather make calls and see another card, LAG players will prefer to make a raise and put the decision back on their opponent. Fearlessness is going to be a very common theme in LAG play. These players don't mind if they are called down lightly or miss their big draws from time to time, because they know that the folds they tend to force will more than compensate for it in the end. In addition to raises and re-raises, LAG players also like to start as much of the action as they can. They don't look for spots to check call or check fold. Continuation bets, double barrels, and triple barrels should be at hand for any LAG player. This is the reason why their variance reaches such dramatic levels. They don't need to have big hands to win, but they are usually in trouble when they get caught. Beating a loose aggressive player is going to be a two-part approach. You first need to be able to beat the winning LAG players, and then you also need to be able to defeat the losing LAG players. As you might imagine, taking on the losing LAG players is the easiest of the two. You are going to need some guts and brains to beat an inventive loose aggressive player, while you can simply value bet and call down lightly against the loosing LAGs. Winning LAG players are going to make you feel helpless in some situations. You are going to end up making some calls after much agony just to find out that you were crushed the whole time. By that same token, however, you'll make some painful calls where you expect the worst but were actually dominating from the get go. The thing about loose aggressive players is that they will make you sweat it out each step of the way. Obviously, you'll want to be as comfortable and confident in your decisions as possible, but LAG players just aren't going to accommodate this desire. To beat a loose aggressive player, you'll need to have strong hand reading skills and the ability to effectively pick apart a line. In other words, you are going to need to be good at the game you are playing. There just isn't another way to put it. If you aren't a winning player at your limit, beating a LAG opponent is not going to be easy to do. A losing loose aggressive player is the polar opposite of a winning LAG player. You won't need to be a poker wiz to take down these opponents with relative ease. For the most part, it's going to go one of two different ways. You can either let the other player take control of the hand while sitting back and letting them hand you their chips, or you can be the aggressor and let them call off their stack. Neither approach is necessarily better than the other and both are dependent upon the specific hand they relate to. If you are in position and are getting bet into, just keep stringing the losing LAG player along, making raises where it's necessary to get their entire stack in the middle. If you are out of position and know that a certain player is prone to coming over the top of your bets or simply calling you down lightly, start firing away. Beating a weak LAG player is one of the easiest things to do in the game. Loose aggressive players serve as the king of the fish and will pad your bankroll nicely over the long run.